The report was in response to a 200-name petition started by Stevie Lewis from Monmouth - who went through "a long and crippling withdrawal" after 11 years of antidepressant dependency. AMs said ministers had no strategy to deal with the problem, despite a growing recognition of it. The Welsh Government said tackling this type of drug dependence was a priority. Ms Lewis told the petitions committee she was prescribed a Selective Serotonin Re-uptake Inhibitor (SSRI) antidepressant for intermittent insomnia and premenstrual tension. In 2002, she realised she was "physically dependent on the drug" and tried for years to come off it, only to experience increasingly severe withdrawal symptoms. "In 2009 I developed a movement disorder which has its roots in long term use of an SSRI antidepressant. Eventually I stopped in 2013 and have been through a long and crippling withdrawal," she added. Explaining what it was like trying to stop taking the drugs, Ms Lewis told BBC Radio Wales: "As the drug is leaving your system, you have very bad stomach issues, gastrointestinal issues. "You become very sick, very nauseous, become very dizzy - it plays a part in your balance - you can have heart palpitations, you're likely to have your sleep affected." But she added that the drugs can change people's lives for the better. "There are many many instances where people will stand up and they will say, 'this antidepressant has really helped me, I don't know what I would have done without it', and that is what is accepted everywhere. "There is another side to this coin, and what is equally true is that antidepressants can harm people and cause them to have problems. "Through this petition and through the people that have experienced the same as me, we are trying to get our voice heard." The report said there were few services specifically for prescription drug dependence and people were often referred to substance misuse services, which may not be suited to providing the right support. While antidepressants are not addictive, some patients experience difficulties when they try to stop taking them. Image caption Janet Finch-Saunders said the personal testimonies to the committee had been "at times, deeply upsetting"
Current advice on withdrawing from anti-depressants was called "insufficient and underestimates the challenges related to coming off these medications". AMs called on the Welsh Government to restate that antidepressants should not be routinely prescribed for mild depression in guidance to healthcare professionals. They said more guidance should be produced and promoted on "safe tapering of prescription medications, both for patients and health professionals". 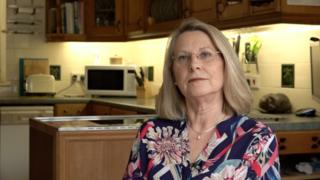 Petitions committee chairwoman Janet Finch-Saunders said: "Antidepressants and other prescription medications can be a lifeline to many people, however, there is a growing body of opinion that it can be difficult to stop using some medications and that not enough advice is available to patients at the outset. A Welsh Government spokesman said: "We invest almost £50m annually to provide a range of services and actions which respond to all forms of drugs (both illegal and legal) or alcohol addiction, this includes prescription and over-the-counter medicines. "We have also previously issued comprehensive guidance and advice to prescribers across Wales."